With its unique mix of materials and linear design, this rectangular end table has a fresh, modern look. 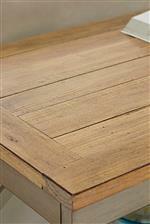 The planked solid wood table top and base highlight rustic style, while the tubular metal frame adds industrial appeal. A glass shelf completes the table, providing additional storage space. 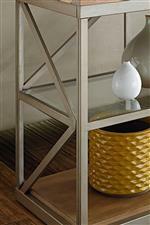 The Modern Theory Rectangular End Table with Glass Shelf by Hammary at AHFA in the area. Product availability may vary. Contact us for the most current availability on this product. Wood & Finish Aged Natural finish. Case Detail Bases made from metal tubing. Case Construction Solid wood planking and metal tubing. The Modern Theory collection is a great option if you are looking for Rustic Industrial Contemporary furniture in the area.